Originally released in 2000, the DIO concept album gets a well deserved, if only marginally improved, deluxe edition reissue. The first disc has the entire original album recording. The story tells the tale of the world of Blessing and the tale of Eriel, Challis and the fight against Shadowcast and the forces of Evilsyde. The story combines both science fiction and fantasy in a way that DIO had mainly confined to a song by song basis in the past and gives it the full blown out story treatment. And what a story it was. The album comes with Ronnie's story fully written out for those that read the album liner notes. You can listen to Ronnie narrate the story on the first cut of the second disc (it was the last track on the original release of the album). 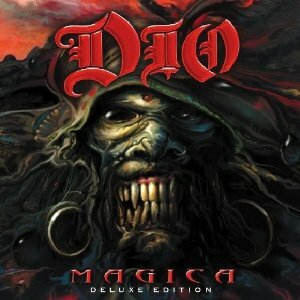 While his early solo albums will likely always be recognized as his best or at least most popular releases, I stand in my conviction that Magica is one of the best recordings of DIO's entire career. From the standout number "Fever Dreams" (one of my favorite DIO songs ever) to heavy rockers like "Feed My Head" and "Losing My Insanity", DIO and his musical compatriots lay down both pure rock greatness and tell a story that would be a knockout prose novel. And what he does to give a love song dramatic heft and a extra helping of testicular fortitude is amazing. "As Long As It's Not About Love" is one of the best ballads Ronnie was ever involved with. So the first disc is a pure A PLUS, 10 out of 10, or 5 Stars depending on what scale you might prefer to use. Where the release gets a little hinky for me is on disc 2. It isn't so much what's being offered but the seemingly haphazard way it was put together. I looked up information on the release and there was some conflicting stuff out there in Internet land. But first, the two "new" songs related to the Magica storyline were "Annica" and "Electra". The former was actually released as a Japanese only bonus track back in 2000. It's an instrumental song and while it is decent, for me really didn't add anything to the mystique of the CD. Meanwhile, the latter song was written and recorded for what was planned to be the Magica 2 & Magica 3 releases. Unfortunately, Ronnie James Dio died from stomach cancer before any more work could be done towards finishing those projects. The song is decent but is a bit of a distraction when you consider you don't really know where the song fits in during the story that we'll never see told. There are reports that the press release included the mention of an extra live cut, <>"Turns To Stone", being included, but it is nowhere to be found on the disc. The five live recordings of songs from the album that did make the cut are well done though. In the album liner notes, there is an essay by British music journalist Mick Wall. While overall it is a good read, it did show that someone needed to do a better job before the package was released. In the essay, Wall alludes to an audio interview with DIO and says that it is included on the reissue. Except it wasn't. I asked why on DIO's Facebook page and the answer I got was " We thought at first there was going to be one. It wasn't included on the final master." That's fine, but someone should've gone back and edited Wall's essay to take out that reference. All in all, I am glad that Magica got the reissue treatment. I don't normally go after reissues but in the case of DIO, I felt I had to both in order to show my support for what I feel is Ronnie James Dio at his writing and performing best, but also so I could do a review that would hopefully help give the album another crack at a wider recognition by any music fan that overlooked it the first time around. I just wish there'd been a bit more attention paid to the quality control so the mistakes enumerated above didn't serve as more of a distraction and instead the ENTIRE focus could've been on celebrating an artist at his peak.